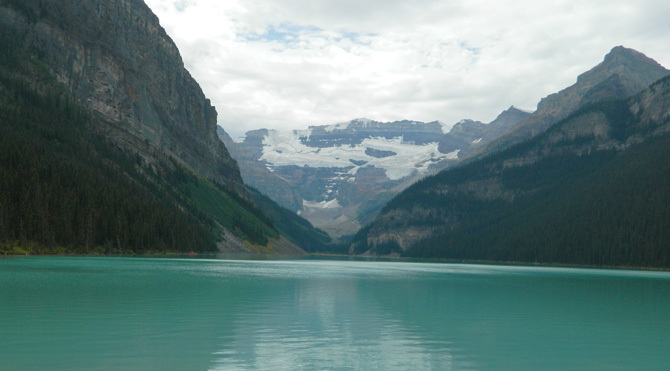 Having heard so much about the Canadian Rockies, we set out last summer to see for ourselves the scenic beauty of Banff, Lake Louise and Jasper. There is no doubt about the majestic blend of heaven and earth as you travel the mountain highways through these Canadian national parks. It reminds one of the Swiss Alps as you gaze at the mountain peaks formed by melting glaciers during the ice age. 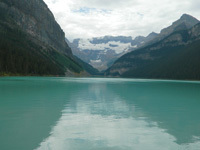 Dense growths of pine and fir trees surround lakes that are tinted aqua by a high concentration of very fine rock sediment, called glacial flour, the result of heavy glaciers grinding down the mountainside. Every turn of the road brings another spectacular view as waterfalls cascade down mountainsides or fast-moving streams rush over boulder-studded courses. Little villages crop up every now and then, and there are always bicyclists pedaling along the road. Parked cars are at nearly every turnoff as hikers enjoy the trails that take you away from the highway.